From NPR and KPCC Public Radio in Southern California, this is an excellent set of articles on how to change the way we teach children such that we acknowledge the impact trauma has on learning. It's great to see that happening - it needs to be something that happens everywhere there is poverty and violence - it's the children in those communities who suffer most. Chronic stress can cause deficiencies in the pre-frontal cortex, which is essential for learning. Our public media colleagues over at KPCC, Southern California Public Radio, have a fascinating two-part report on the efforts of schools in the Los Angeles area to address the effects of "toxic stress" on student learning. "As researchers work to solve one of the most persistent problems in public education – why kids in poor neighborhoods fail so much more often than their upper-income peers – more and more they're pointing the finger at what happens outside the classroom. Shootings. Food insecurity. Sirens and fights in the night. Experts are finding that those stressors build up, creating emotional problems and changes in the brain that can undermine even the clearest lessons." Eighty percent of the students in the Los Angeles Unified School District are in poverty. 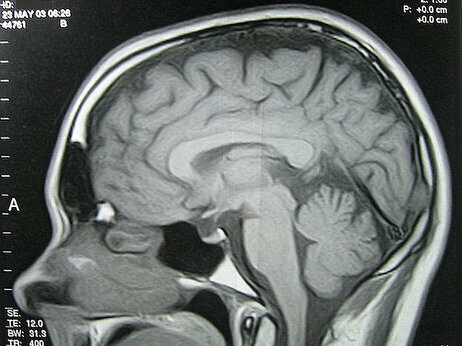 Scientists are zeroing in on how it can affect their developing brains. "Studies show chronic stress can change the chemical and physical structures of the brain. 'You see deficits in your ability to regulate emotions in adaptive ways as a result of stress,'said Dr. Cara Wellman, a professor of neuroscience and psychology at Indiana University. Dendrites, which look like microscopic fingers, stretch off each brain cell to catch information. Wellman's studies in mice show that chronic stress causes these fingers to shrink, changing the way the brain works. She found deficiencies in the pre-frontal cortex – the part of the brain needed to solve problems, which is crucial to learning. Other researchers link chronic stress to a host of cognitive effects, including trouble with attention, concentration, memory and creativity." Responding in part to this research, Camino Nuevo, a network of eight charter schools, dedicates resources to creating what it calls a "continuum of integrated support" for students. One fourth of students at the schools see counselors to help them build social and emotional skills. The schools hold group sessions for parents to help them deal with stress in their lives too, and employ full-time parent liasions to help families access health care, mental health, housing, legal, or immigration services. To pay for all this, the schools privately raise about $1.6 million in outside funds. They also tap into MediCal and work with private providers to integrate services right within the school. 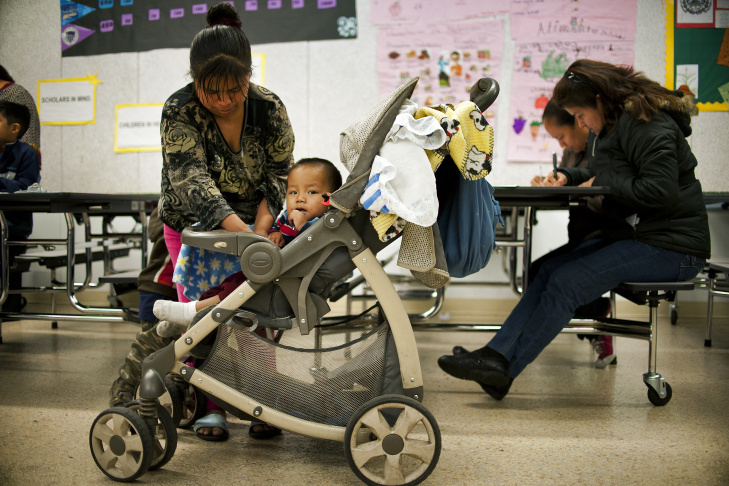 Blanca Ruiz is a Mexican immigrant and single mother with a child, Luis, at a Camino Nuevo middle school. "Since she started counseling at the school, Ruiz lost fifty pounds and saved money to buy a reliable car. Last year, Ruiz moved her kids 15 miles east to a house in El Monte with a tiny porch and big lemon tree. But there was no way she was changing schools. Luis's sixth grade teacher, Sarah Wechsler, keeps a close eye on him. She tracks even the smallest details, like how often she encourages him. She wants to make sure positive reinforcements far outpace stern talk. Wechsler said in the last year, she's seen Luis completely turn around and take ownership of his schoolwork." At LAUSD public schools, it's a different story. Resource constraints mean just one percent of the school population can access mental health services. Read the rest of the series here. Here is the remainder of the story linked to at the end of the NPR piece. Training in self control starts early at Camino Nuevo. Karina Rodriguez leads preschoolers through a motor skills exercise, asking them to start and stop based on musical cues. Students will be exposed to 14 years of curriculum designed to address academic and soft skills. 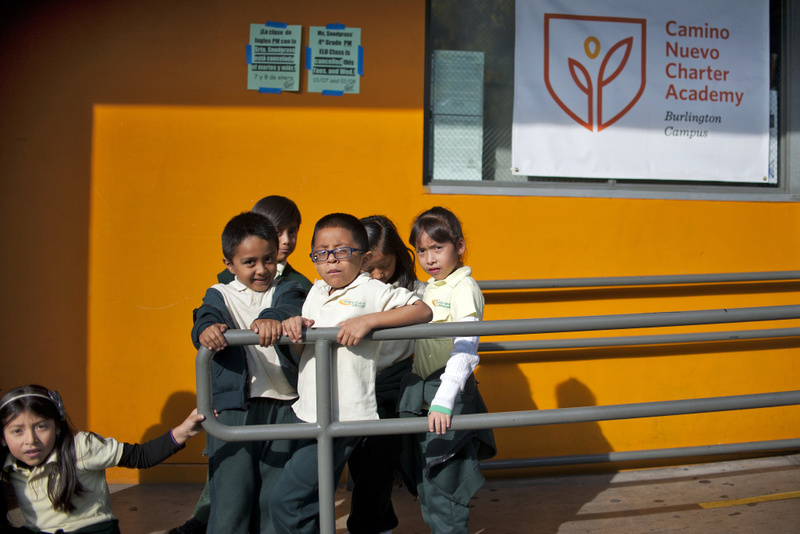 Teaching Through Trauma: the first in a series of stories on poverty in Los Angeles schools. Read Part Two here. New research shows the mere fact of being poor can affect kids' brains, making it difficult for them to succeed in school. Los Angeles public schools — where more than 80 percent of students live in poverty — illustrate the challenges for these students. Less than half of third graders in L.A. Unified read at grade level and 20 percent of students will have dropped out by senior year. But researchers also offer hope. They said the right interventions can make a difference. And one school in MacArthur Park is battling biology by helping children with life as well as school — to growing success. For students in many Los Angeles public schools, those chronic stressors are everywhere. Take MacArthur Park, where Census surveys show the child poverty rate is double the California average. The neighborhood’s namesake grassy square is so crime-ridden that many parents refuse to let their children play outside. The Los Angeles Police Department arrested 3,000 juveniles in the neighborhood in 2011 alone, the most recent data available. Most were for theft — but 14 were taken in on suspicion of homicide. Kids here deal with parents being deported, siblings being locked up or social workers being called in to take kids away from neglectful or abusive parents. They often live in cramped, crowded apartments with two or more families. Ana Ponce herself grew up an immigrant in MacArthur Park and thought: it’s time to change how a school tries to reach students. “We had this understanding that we can not teach kids that are not ready to learn because they were preoccupied with all of the barriers they encountered on their way to school - or all of their fears they had leaving school,” she said. In the early 2000s, Ponce joined the leadership of a small charter school called Camino Nuevo in her neighborhood. It has since grown to a network of eight schools. Sarah Wechsler reported a dramatic improvement in one of her students, whose mother was recently deported. Ponce said she sees the school’s job as improving the lives of students’ entire families. Staff helps parents enroll younger siblings in preschool and hooks parents up with healthcare providers. School sites have a full-time parent liaison to provide referrals for those struggling with housing, employment or legal problems. In group sessions, parents are taught how to participate in their children’s education and relate better to them. Camino Nuevo’s teachers are trained to track not just academic progress but also overall wellbeing. If academics slip, they offer reading or math tutoring. In the same way, when emotional or behavior issues bubble-up, a student is referred to a counselor to develop those equally vital emotional skills. At Camino Nuevo, about one in four students receives one-on-one counseling or group interventions. They don’t just talk about their problems at home, but also learn how to process emotions and make better decisions. “They need the place to - you know – detox, so to speak. To let go. To get all this out, and to learn about themselves,” said Gloria Delacruz-Quiroz, head of mental health at Camino Nuevo. Research shows that not all children who experience trauma will struggle emotionally. Those who feel they have support from an adult seem to do better. Ninety-seven percent of students at Camino graduate high school, compared to 68 percent district-wide, where the rate slips even further for Latino and low-income students. To pay for it, the school taps MediCal, California’s version of Medicaid. The charter school created a system where its own staff works alongside private counseling service providers - including the Los Angeles Childhood Development Center and Didi Hirsch Mental Health Services – right at the schools. The services aren’t free. Camino Nuevo scrapes together $1.6 million to cover what the providers cannot, plus a smattering of other services school leaders term their "continuum of care," which include not just counseling but things like after school programs and field trips. Camino Nuevo’s Burlington middle school campus is around the corner from where Blanca Ruiz works long hours at a nail salon. 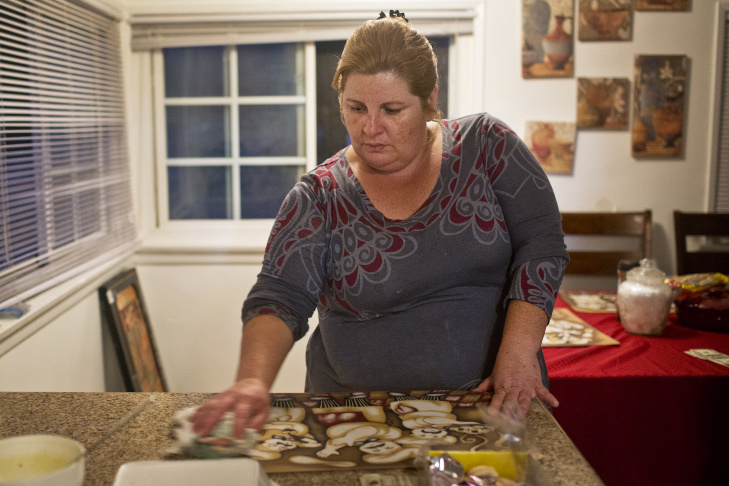 Since she came here from Mexico years ago, she often felt she was barely keeping it together. She was sharing an apartment with her two kids and several roommates. Sometimes the stress would overwhelm her kids. Her son Luis acted out. He got bad grades. He refused to do what his mom said and that enraged her. “She screams because I don’t want to listen to her,” he said. In class, sometimes Luis would stare off at his desk, checked out; other times he’d become disruptive, start talking, get up and walk around. He expressed no interest in learning and made it difficult for other students in class to stay on task. “Sometimes I forgot, or sometimes I would decide not to do my work,” he said flatly. In fifth grade, he was sent to the principal’s office for ignoring his teacher’s instructions. The principal suspended him from school. Rather than write him off, the staff at Camino Nuevo got him to meet with a mental health counselor at the school. He also received tutoring everyday to catch up in math. His mom went to the school’s group sessions for parents. “I think it helped me because if you want to help your kid, you have to be emotionally stable, a clear mind and more positive,” she said. Since she started counseling at the school, Ruiz lost fifty pounds and saved money to buy a reliable car. She still drives Luis to Camino Nuevo in MacArthur Park every day on her way to work. Sometimes she’ll bring him a special treat of KFC for lunch. Luis’s sixth grade teacher, Sarah Wechsler, keeps a close eye on him. She tracks even the smallest details, like how often she encourages him. She wants to make sure positive reinforcements far outpace stern talk. 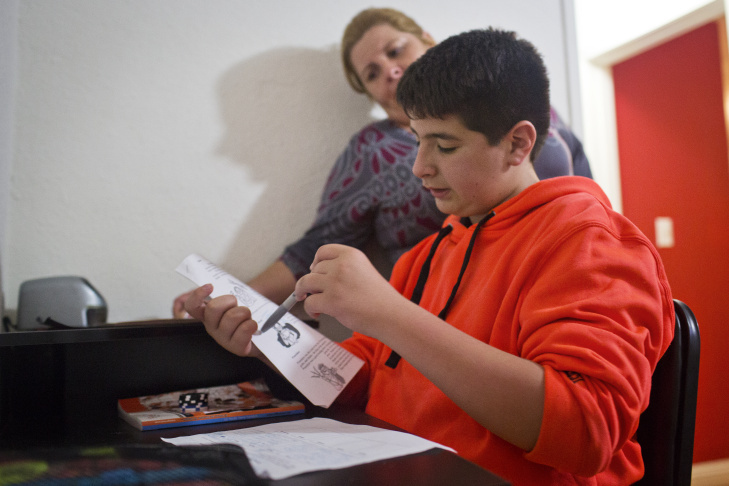 Wechsler said in the last year, she’s seen Luis completely turn around and take ownership of his schoolwork. “You want to be your own man, don’t you?” she said, smiling at Luis with encouragement. Luis still has days where he feels unfocused, and Wechsler allows him to take breaks or move to another desk. On a recent school day, Luis chose the table facing a wall. Without distraction, he hunkered down to divide fractions. As the school year was drawing to a close, evidence of Camino Nuevo’s work – and Luis’s - became evident in one unmistakable way: He finally reached grade level in math. CORRECTION: An earlier version of this story misidentified Ana Ponce as a founder of Camino Nuevo and misstated its current number of campuses. KPCC regrets the errors.